The British royal family released a family portrait yesterday that will be used to commemorate Her Royal Highness Queen Elizabeth II’s 90th birthday, and the photo makes one thing abundantly clear: The queen’s great-grandson, 2-year-old Prince George, is quite the royal ham. More: Mom posts sweet selfie with newborn online — what could possibly go wrong? The photo — and the cheeks in question, but not the signature kneesocks, sadly — will be made into a set of limited edition stamps available to Royal Mail customers. The regal toddler had to stand on a little stack of blocks to be level with the other three generations of his family, which besides adding an extra “aww” factor is a reminder that even royal families require a bit of manhandling by family photographers. Who doesn’t remember standing on their own little plywood stool in a mall-adjacent Olan Mills when they were a kid so that every sibling was shoulder to shoulder in their matching sailor collars and shoulder pads? The only difference is that your average kid’s plastered-on, are-we-done-yet smile looks a little less sincere. The cheese on the prince’s face is 100 percent natural, through and through. Well, that and the fact that the only people collecting a replica of your face were going to be a few aunts and uncles, whether they wanted to or not, when your mom slipped the awkward snap into the yearly Christmas card. But other than that? Pssht, practically identical! In all seriousness, though, there’s one other huge crossover between the lives of the royal family and your own significantly less royal life, and that’s that if you ever have the chance to take a photo of four generations (or more!) at once, you’d better take it. There’s lots that’s special about this particular photo — it’s Her Royal Highness’ double sapphire birthday tomorrow, and 90 years is a big deal. Not that she looks a day over 75, mind you. Having a keepsake of this kind would be special for any kid (and any grandmother! 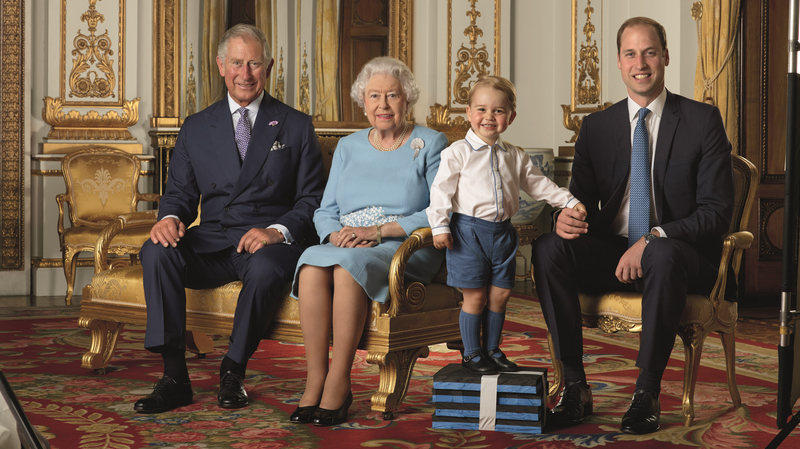 ), and that includes little George, who certainly looks thrilled to be a part of such a momentous occasion.